Thank goodness lemons are so good for you, because I have been starting my morning for years with a 8 ounce glass of freshly squeezed lemon water, I even have a favorite lemon water pitcher (pictured below) As a Health Coach I recommend this to almost all of my clients! Lemons are rich in vitamin C and citric acid, lemons help the enzymes in your body function, which in turn will stimulate the liver and help it detox. Lemons also contain vitamins A and B5, potassium, calcium, phosphorus, and iron just to name a few! Starting every morning with a glass of warm lemon water is actually a ritual in some traditions to stimulate digestion for the day and to help clear the body of any toxins that may have settled in the digestive system while we sleep. In the morning we tend to reach for warm drinks like coffee and tea, try starting your day with warm lemon water first to kick-start your digestion, I prefer to drink it chilled, which is fine it will still work to detox your body, but more important, make sure the water is purified. I recommend half a fresh lemon per large glass of water. 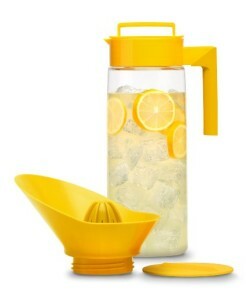 Fresh lemons take plain old water up a notch and actually help most people drink more water throughout the day! Lemons are high in the antioxidant Vitamin C and potassium, Vitamin C is known for it’s role in a healthy immune system, which may reduce the risk of respiratory infection. Potassium is great for brain and nerve function as well as controlling blood pressure. 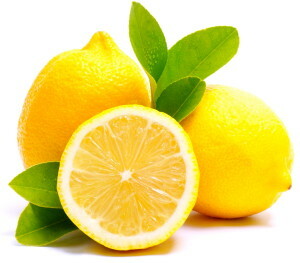 Ascorbic acid (vitamin C) found in lemons has anti-inflammatory properties and enhances iron absorption in the body; iron plays an important role in immune function, the ascorbic acid found in lemons can also help wound healing, and is an essential nutrient in the maintenance of healthy bones and connective tissue. Citrus flavonols in lemons are used as an aid in digestion to stimulate and help purify the liver; lemon juice is used traditionally to support digestive hydrochloric acid in the stomach to further aid digestion. Vitamin C and other antioxidants that are found in lemons also combat free radical damage caused by UV exposure and environmental toxins that are responsible for the many signs of aging. Lemon water purges toxins from the blood and helps keep skin clear. While the tartness of a lemon may make them seem acidic, lemons are one of the most alkalizing foods for the body. Because lemons contain citric and ascorbic acid, they actually help to alkalize the blood. And this is key to good health, it has also been shown that people with a higher alkaline diet lose weight faster. Lemons are also high in pectin fiber, pectin fiber helps fight hunger cravings which aids in weight loss. Starting the day off with a glass of lemon water will put you on track and start the day off on a healthier path! The other added benefit to lemon water is that the scent is refreshing and energizing, this helps wake up your senses in the morning, so drink up and watch the benefits begin! This entry was posted in Beverages and Smoothies.